Remastered edition of King Crimson's seminal album IN THE COURT OF THE CRIMSON KING. Title: In the Court of the Crimson King. Artist: King Crimson. Format: CD. Item Condition: New and unplayed. Moonchild Including the Dream & The Illusion. Artist: King Crimson. The Court of the Crimson King. 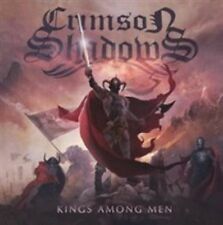 The Court of the Crimson King [5.1 Digital Surround] [DVD]. The Court of the Crimson King [2009 Stereo Mix] [Version]. The Court of the Crimson King [Original Master Edition 2004] [Version]. Title: Lizard: 30th Anniversary Edition. Artist: King Crimson. Format: CD. Condition: New. Prince Rupert Awakes. Lady of the Dancing Water. Happy Family. Title: In the Wake of Poseidon (40th Anniversary Series). In the Wake of Poseidon. In the Wake of Poseidon [5.1 Digital Surround]. In the Wake of Poseidon [2010 New Stereo Mix]. Artist: King Crimson. In the Wake of Poseidon [1970 Stereo Mix]. USA is a live album recorded towards the end of King Crimson's final US tour of the 70's in June 1974. It was issued as an epitaph for the band in Spring 1975 as a single album. Includes a bonus DVD which features Hi-Res stereo versions of the three different album mixes: expanded 30th anniversary edition, Ronan Chris Murphy mix & previously unreleased Robert Fripp/David Singleton mix. Title: Starless and Bible Black: 30th Anniversary Edition. Starless & Bible Black. This is the 30th Anniversary edition of King Crimson's STARLESS AND BIBLE BLACK album. Artist: King Crimson. Night Watch. Title: Larks' Tongues In Aspic - 40th Anniversary Edition. Larks' Tongues in Aspic, Pt. 1 [2012 Mix Lossless Stereo]. Lark's Tongues in Aspic, Pt. 1 [2012 Mix 5.1 Surround]. 2 [2012 Mix Lossless Stereo]. Artist: King Crimson. 40th anniversary edition includes DVD. Having released two albums in a nine month period between October 1981 and July 1982, "Three of a Perfect Pair" is the final part of the recorded trilogy begun with "Discipline" and "Beat". king crimson in the wake of Poseidon cd. Condition is Like New. Shipped with USPS Media Mail. Title: In the Wake of Poseidon: 30th Anniversary Edition. This is the 30th anniversary edition of King Crimson spent 1970 as a studio band recording a single "Catfood" and the follow-up to their debut album. 40th anniversary edition includes DVD. "Beat" was released in June 1982 just eight months after the 80s Crimson lineup debut album "Discipline". It marked the first occasion where a King Crimson line-up had remained intact for a two album stretch and was also the first album by the band to employ a separate producer - Rhett Davies. 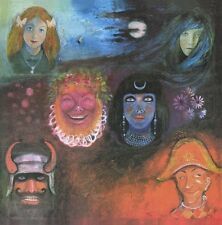 USA was originally recorded on King Crimson's final U.S. tour in June 1974. Artist: King Crimson. Title: USA: 30th Anniversary Edition. Format: CD. 21st Century Schizoid Man. Item Condition: New and unplayed. Artist: King Crimson. Lizard [5.1 Surround]. 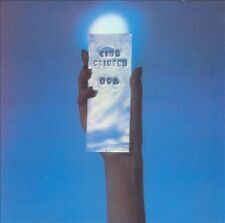 Digitally remastered and expanded two disc (CD/DVD) edition of this 1970 album from the Prog Rock legends. Also included is a DVD-A featuring a 5.1 DTS Mix and a High Resolution Stereo Mix (24bit). Title: Live In Newcastle. 8Th December 1972. Artist: KING CRIMSON. Format: CD. Missing Information?. Reissue of King Crimson's DISCIPLINE, includes an alternative version of "Matte Kudesai". Title: Discipline. Label: Discipline Us. Artist: King Crimson. Format: CD. Item Condition: New and unplayed. DGM & Panegyric are proud to present the first full concert release by the current line-up of King Crimson. This Official Collectors' Bootleg captures King Crimson on a single night in the middle of the band's Canadian tour in November 2015. Artist: King Crimson. Title: Islands: 30th Anniversary Edition. Format: CD. Item Condition: New and unplayed. Sailors Tale. Modelk Man - King Crimson, King Crimson. Nuyages (That Which Passes, Passes Like Clouds) - King Crimson, King Crimson. No Warning - King Crimson, King Crimson. Industrial Zone a - King Crimson, King Crimson. Live in Vienna, December 1st, 2016 [4/6]. Title: Lark's Tongues in Aspic. Lark's Tongues in Aspic, Part One. Lark's Tongues in Aspic, Part Two. 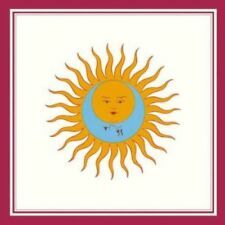 Reissue of King Crimson's LARK'S TONGUES IN ASPIC original released 1973. Artist: King Crimson. Format: CD. Factory Original CD All used CDs have been checked with CD testing software and play perfectly Factory Original Front and Back Inserts. We do not send out cracked jewel cases. CD may be BMG or Columbia release (see scans). Title: In the Court of the Crimson King. Artist: King Crimson. The Court of the Crimson King. 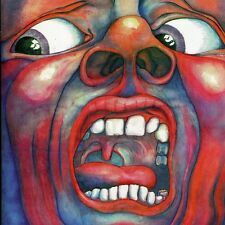 The Court of the Crimson King (Part 1) [Mono Single Version] [Single a Side. The Court of the Crimson King (Part 2) [Mono Single Version] [Single B Side. ]. CD II Jurassic Thrak (Edit) - Thrak Recording Sessions: From Forthcoming Thrak Boxed Set. King Crimson - Thrak - 40th Anniversary Edition [New CD] Anniversary Edition, With DVD Audio Disc. Title: Thrak - 40th Anniversary Edition. King Crimson - Level FIve CD. Limited Edition Tour CD (#1,608). The CD is in perfect condition with no scuffs or scratches. It has been tested and plays perfectly. The Artwork is in excellent condition with no tears, creases, stains, etc. The DVD includes 5.1 surround playable on DVD players. It is in great condition all around. This item is in Like New condition. For sale is the CD edition of the Tony Levin album World Diary. The CD was released in 1995 by Papa Bear Records. This CD is in Good Condition. Not a Cut-Out. King Crimson - Collector's Club: 1972.3.12 Denver. DOES NOT AFFECT THE PLAYBACK. OUT OF PRINT CD. CD RECORDS CASSETTE ARE ALL NOW COLLECTABLES. I HAVE JUST OBTAIN A HUGE CD COLLECTION AROUND 10,000 CDS N DVDS. NO RESERVES LETTING IT ALL GO WITH NO RESERVES. KING CRIMSON Earthbound CD mini LP 2002 Virgin EU made in Holland, excellent condition used. In The Court of the Crimson King: 30th Anniversary Edition. KING CRIMSON. The Court of the Crimson King. Item Condition: VERY GOOD, CD never played, CD is mint. This is a first edition.I’m the original owner. Artist: david cross. Title: the big picture. Format: CD. I will work out issues/problems. Condition of disc: VG . Made in England. King Crimson - Collector's Club 1972.11.25. CD contains five different recordings of 21st Century Schizoid Man: original version, an edited version plus three live recordings- One from 1969, one from 1972 and one from 1974. Title: Great Deceiver 2. The Great Deceiver. 15 years on from that release, with the music sounding as vital as ever, the set is reissued across twin 2 CD sets. Artist: King Crimson. Format: CD. Item Condition: New and unplayed. Title: NIGHTWATCH. ABOUT SPEEDY HEN LLC. Length: 142 mm. Width: 124 mm. Live in Berkeley, CA is a live album by the band King Crimson, recorded at the Greek Theatre, Berkeley, California, United States, on August 13, 1982. It was released through the King Crimson Collectors' Club in May 2001. Excellent Condition! FREE TRACKING/DELIVERY CONFIRMATION ON ALL ORDERS!! Ships Safe, Secure, & Fast! 100% MONEY BACK GUARANTEE! Artist: King Crimson, Projekct Two. This is the King Crimson project. Title: Space Groove. Space Groove II. Space Groove III. Space Groove I. In Space There Is No North, in Space There Is No South. Laura in Space. 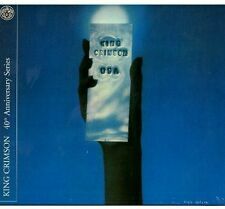 King Crimson - Collector's Club 1973.4.6. Artist: King Crimson. In the Court of the Crimson King. Century Schizoid Man through it's life. Format: CD. 2Ist Century Schizoid Man. 21st Century Schizoid Man (Solos).